Take an old emotional wound – the older the better. Something that shakes your sense of security or self-worth. Bonus points if it’s attached to sexuality or body-image. Cover it over with bunch of round-about strategies that deal with the symptoms, but be careful to never deal directly with the cause. Give that wound plenty of time to fester. Adopt other peoples’ measures of success as your own measure of worth. Pursue achievements, fame and money like your happiness and sense of identity depend on it. Always put these external metrics of achievement ahead of your own health, happiness and personal relationships. At the same time, remember to keep shifting the goal posts, so no matter how well you do, you never feel complete. Beat your self up for not measuring up to your own unrealistic expectations. Name-calling (stupid-fatty) is especially effective. In some cases, the wound may continue to make itself felt, or resurface in particular moments of crisis. Consider substance abuse. Many people have found excessive alcohol consumption an effective way to numb the pain, but there are many over-the-counter options available. As your health and relationships deteriorate, escape by plunging yourself further and further into your work. Avoid situations where there may be a temptation to honestly reflect on your life (vacations, alone-time etc). Aim to spend all of your waking hours symbiotically connected to an electronic device. Get a shower radio. Invest heavily in the fantasy that if you just had more money, the many gaping holes in your life would magically be healed. If you follow all of these steps with conviction and discipline, then I can almost guarantee you’ll wind up with stacks of money, and probably have at least several good years to enjoy it before your kidney/liver/mind gives out. Now of course, this route isn’t for everybody. And if it does appeal to you, then my courses probably aren’t for you. But it does work. As tragic as it is, this is the road a lot of people have gone down over the years. The world is an abundant place. If you’re willing to sacrifice everything for money, then of course you’re going to end up with lots and lots of heavy great bags of it. But we all know, at least deep down, that money is not the real point. The things we all want in life are remarkably similar – happiness, a sense of meaning, robust health, rich relationships, tim tams. But money is seductive because it is tangible and countable. You can actually hold on to money. Happiness is only in your heart / soul / empty tim tam box. And money is built into divisible units that assist counting. You can’t count health. 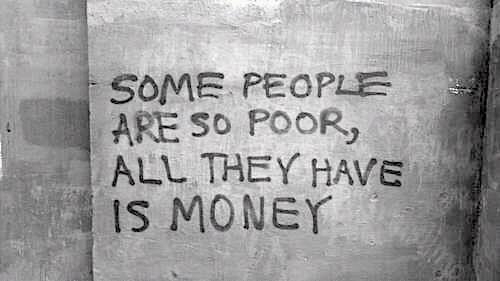 And so money is an easy thing to aim for. The trap then is that if our wounds are many layers deeper than consciousness (and most are) then they can fill us with a drive to fix something, but we don’t quite know what that something is. We become full of drive, but lack direction. Money gives us that direction. It’s simple and easy to understand. You can count it and easily measure your success. And everyone else seems to want it. And locking our soul’s GPS onto money is a lot easier than going within and figuring out what really needs shifting – what we truly want. This is something I’ve seen a lot of over the years. Normally a big part of my job is giving people a good kick up the bum. Help them break the inertia of their routine, and get ‘em up and going. But every now and then a student will come to me with too much drive – with too much ambition. Then my job becomes one of grounding them and slowing them down. Because often-times, the super-driven student is actually running from demons. I remember one student who had been having a bit of a rough trot in life. She wasn’t gelling with her partner, her kids were going through a difficult stage, work was a torture. A million dollar property portfolio became an escape hatch. She needed $100K passive income yesterday! She was desperate. But you rarely make good decisions from a place of desperation. And patience is still a virtue in this game. Or I remember another student who was obsessed with building the paper wealth of his portfolio. I remember looking at it and telling him he should lose some dud properties that just weren’t performing. Trouble was he needed those properties. When we got to the bottom of it, he realised that he needed to be able to tell his parents he was worth such and such amount – to prove his ‘worth’. If you’re not coming from the right place – your own place, no one else’s – then you won’t make good decisions along the way, and you’ll be disappointed when you reach your goals that they haven’t magically fixed your life. And it’s hard to stay motivated when achieving your goals just leaves you feeling deflated. So the first step, the very first step, is to tune in to what you really want and what you really need. Then place the property journey in service of that. If you don’t have a clear idea of this, then your journey can be hijacked by any old rogue and long-suppressed motivation. You’ve got to know what you really want. This isn’t necessarily the road to riches. But it is a road to happiness.